The captain pondered his problem as he tried to keep his boat on course in the storm. He knew that his ship couldn’t survive much longer at sea in the gale force conditions but it was also pitch black and apart from the occasional flashes of lightning, he couldn’t see what was ahead. The captain knew that if he stayed at sea that his boat would sink but he also knew that on the way to land that he could hit rocks and his boat would never survive the impact. He was in a no win situation and so he had decided to take a chance on trying to get to shore. The captain was sinking deeper into despair when he saw the light and he turned his boat towards it. As he moved closer he realized that he could see a lighthouse and he remembered the stories that he had heard about the island he was heading towards. The island was surrounded by dangerous rocks the lighthouse had been put there to guide ships safely in to the harbour. 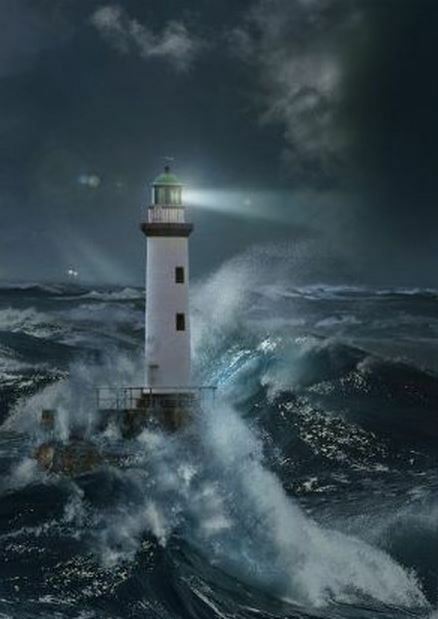 As the reality of the lighthouse and the hope it offered him sunk in he shouted for joy. He was no longer alone! He now had the light to guide him and to keep him safe. He was no longer afraid, because he knew that the light would guide him safely to shore. A few minutes later and the captain could see the shoreline around the lighthouse but that is when he also began to hear music. As he strained to hear he realized it was coming from further along the shore and so he steered towards it. As the boat moved forward, the music got louder and as it dd, the light was forgotten. The captain was mesmerized by the music and he looked ahead intently to see where it was coming from. Suddenly, there was a flash of lightning and fear gripped the captain’s heart as he saw rocks dead ahead. The captain swore and he began to turn the wheel as fast as he could and the boat changed course. 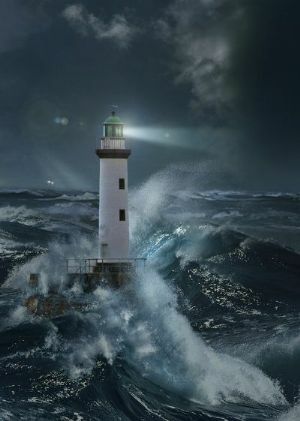 The captain looked around him for the lighthouse and when he saw it he set course for it once again. The captain was furious with himself, but he was also relieved that he was somehow safely back on course. The boat lurched forwards and the closer that he got to the light, the safer the captain felt. Then the captain heard a voice. ‘Ahoy there’ came a shout from his starboard bow. ‘Follow me’ shouted the person on the nearby boat, ‘I know the way’. The captain was ecstatic! Not only did he have the lighthouse but he now had another boat to follow. Then the captain realized that the boat in front was heading away from the lighthouse and he had a dilemma, what should he do? Following the light to safety felt sensible but the other person claimed to know the way and so the captain turned to follow them. A few minutes later there was a sickening sound of splintering wood and the boat in front began to sink. The waves were pushing the captain’s boat closer to the same rock and so he turned his wheel until he was heading away again. This time he followed the light all the way to shore. When you in a boat following a light to safety, you need to follow it wholeheartedly otherwise it is of no help to you. May we follow Jesus, who is like our lighthouse in life. You can think about this some more using this video ‘My Lighthouse’ by Rend collective. The images and video also make this an ideal video to use in church or a group setting. This entry was posted in discipleship, Faith, Following Jesus and tagged discipleship, follow Jesus, follow Jesus consistently, follow Jesus wholeheartedly, free video resources for church, God guiding us, Jesus is the light, kind of following Jesus doesn't work, lighthouse story, modern parable, my lighthouse, parables, rend collective. Bookmark the permalink. Reblogged this on Honest about my faith.